Kyrie Foster scores for Netherton against Peterborough Sports Reserves. Photo: David Lowndes. Netherton United are effectively a point away from their first Peterborough Premier Division title after putting reigning champions Peterborough Sports Reserves to the sword yesterday (April 28). The city side crushed their local rivals 11-0 in a match transferred to the Grange. They are now 11 points clear at the top, but defeat in their final match - a tough game at third-placed Whittlesey Athletic on Tuesday (May 1) - would open the door for sole chellengers Moulton Harrox. Callum Madigan (red) in action for Netherton against Peterborough Sports Reserves. Photo: David Lowndes. Harrox currently have three games in hand and a vastly inferior goal difference, but if Netherton do slip up at Feldale Field, four wins in their final four matches would enable the South Lincs club to pinch top spot. Ondra Odain led the way for Netherton yesterday with four goals. Kyrie Foster, Steve Mastin and Zack Fisher all scored twice with Jack Barron completing the scoring. Netherton have now scored a remarkable 137 goals in 29 Premier Division matches. 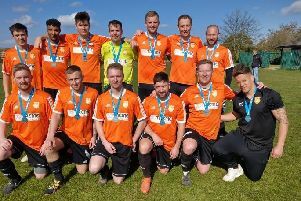 Moulton Harrox had a weekend off Peterborough League action as they claimed a fifth Lincs Junior Cup on Friday night (April 17). Joe Townsend scored twice early on against Coningsby at Skegness Town FC and further goals arrived from Ash Coddington, skipper Billy King and Declan Earth. Bobby Patterson was sent off late in the game. Harrox play at Sutton Bridge in a Premier Division match on Tuesday. They also have league games remaining at home to AFC Stanground (May 5), Holbeach United Reserves (May 8) and Stamford Lions (May 12). Action from Netherton United's 11-0 win over Peterborough Sports Reserves. Photo: David Lowndes. Sawtry beat bottom club Langtoft United 3-1 in the only other top-flight fixture played on Saturday. Ashley Smith scored twice as Langtoft completed a 30-match campaign without winning a game. They collected just one point, but finished the season on -2 after suffering a ppoints deduction. Premier Division: Peterborough Sports Res 0, Netherton United 11 (Odain 4, Foster 2, Mastin 2, Fisher 2, Barron); Sawtry 3 (Ashley Smith 2, Graham), Langtoft Utd 1 (Briggs). Postponed: Ketton v Whittlesey Athletic, Deeping Rangers Res v Warboys Town.